Geoff Johns: Much like Wonder Woman, who I've had an epiphany about over the last year or so, the same thing happened with the New Gods when I went back and reread all these New Gods comics, and Mister Miracle comics -- I knew I wanted to bring the New Gods into this, with Darkseid and Grail and Anti-Monitor, but when I was reading them all, I said, "Which one is going to be a thorn in Darkseid's side the most?" Originally I thought it was Orion. But actually, it's not Orion -- it's Scott. The reason it's Scott is because if you look at what Darkseid wants, he wants his will imposed over everything. If there's one thing that keeps slipping through his fingers -- one soul, one person that keeps escaping his grasp -- he's going to notice that, and it's going to ultimately become an annoyance to him. And if that one thing starts to affect other things, it's going to be a problem. So if Scott is someone who embodies free will -- he's all about escape, that's his whole thing. He is the ultimate protagonist against the antagonist of Darkseid. 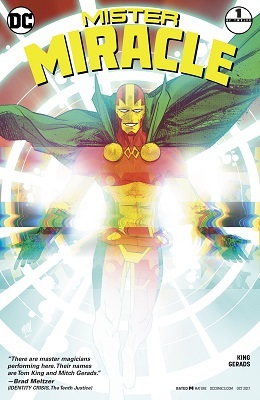 "Oh, it's not Orion at all, it's Mister Miracle -- let me get more into Mister Miracle." As I got more into that character, I fell in love with that character. The League moves into their new embassies. Bruce & Guy are going over the one in Moscow, Dinah, Beetle, & Booster the one in Paris. The rest are handling the New York City embassy. The building is a fixer-upper.